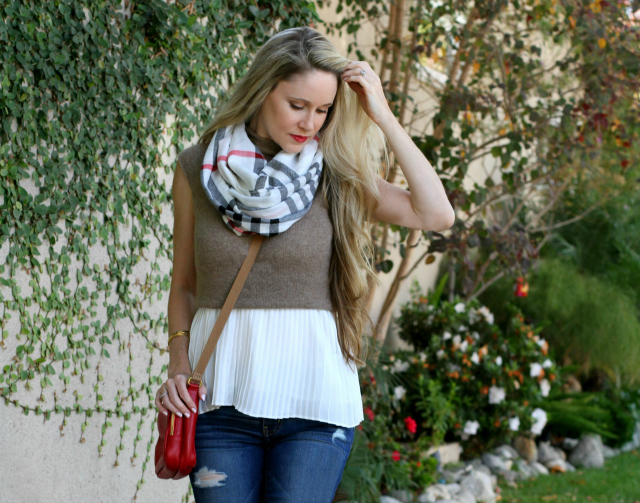 Lightweight layers are key for Fall in Southern California. 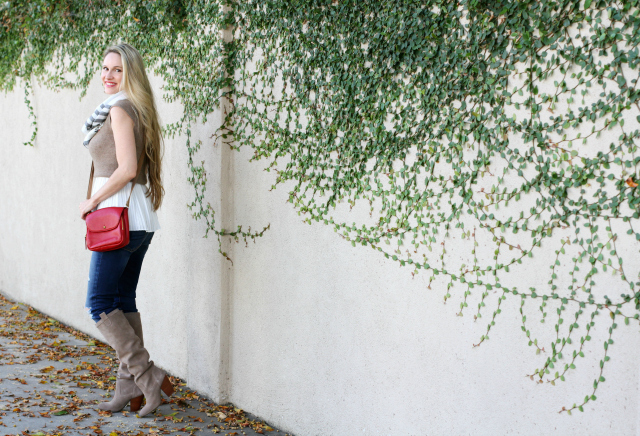 Today I'm featuring an easy, transitional Fall look with light layers consisting of pretty pleats, plaid, and suede. This type of layered look is always one of my go-to looks when it's still too warm for heavy, bulky layers but just cool enough for scarves and boots. 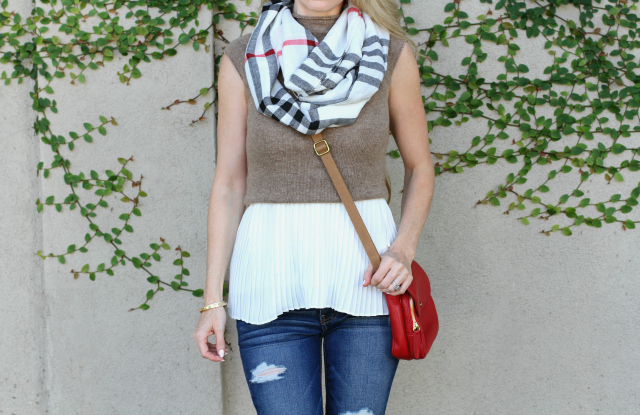 Pleated tops are a great layering piece. 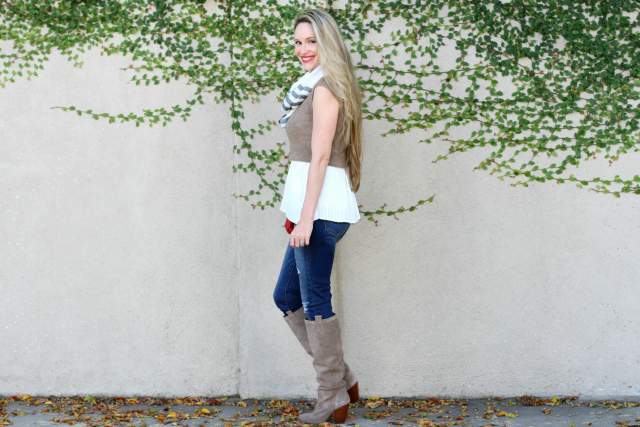 I found this white one at Forever 21 last season, and knew it would be a versatile top to add to my arsenal. It's lovely on its own or layered beneath cropped blazers or lightweight sweaters. I went with the latter for this look, and decided a sleeveless, mock-neck sweater would be the best choice for the lingering 80s/90s temperatures here in L.A. 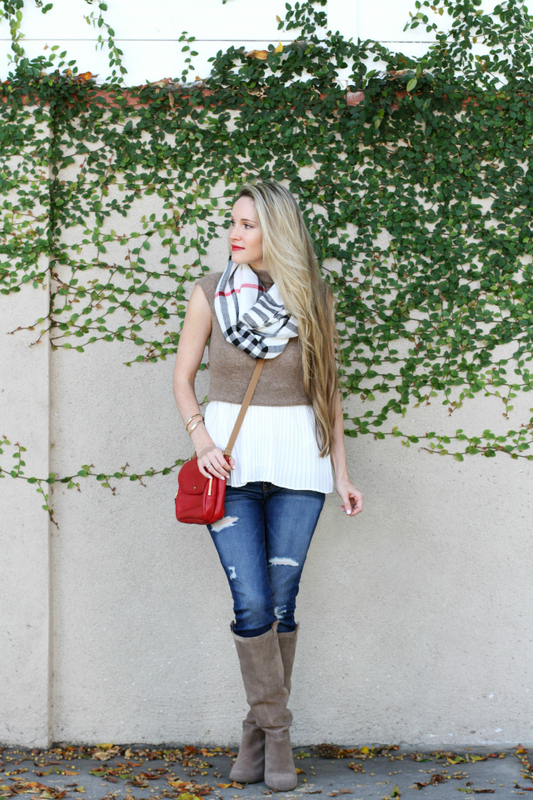 This beige, wool-blend sweater from Banana Republic is so soft and pretty. I love the neutral color and the slightly shrunken fit, which works well for petites with its shorter and more slim-fitting cut. It was a sale score from several years ago, but it could easily be swapped out with this one or this one for an identical look. Since I wanted to really highlight the pleats of the underlying tank, I simply tucked under the hem of the sweater once evenly, then again, to give the illusion of a layered, cropped sweater. And because I already have a slight obsession with faux-layered tops and sweaters, I was really happy with how it turned out! The sweater adds a nice bit of texture, and the peek-a-boo pleated hem also adds a fun, flirty twist. Once the weather cools, I plan to layer this tank with thicker, long-sleeved sweaters. For this look, I opted for dark, distressed skinny jeans. This pair from American Eagle is a longtime favorite; it comes in several washes, has a hint of stretch, and has just enough distressing for my liking. The slim ankle fit is also ideal for tucking into boots to minimize unsightly and uncomfortable bunching. Similar pairs online that look promising are here, here, and here. If you're similar in height to me (I'm 5' 2") petite or cropped skinny jeans with inseams of 26 - 28" will work best with boots, preventing having to roll them up at the ankle. I just tuck the bottoms of my jeans into a thin pair of socks to anchor them and that usually does the trick. Let's talk about these boots, shall we? I'm kind of in love with them. The suede is soft and supple and the 'dark mushroom' color is a beautiful, dark taupe that goes with everything. They're also super comfortable. These are the Sole Society Rumer Boots that I scored on major sale last year. There was only one size 5.5 left in stock, so I didn't even hesitate to order them. I'm so happy to report that these boots are still available online albeit in very limited sizing (size 5 appears to be the last in stock) but this year's Sole Society Cleo Boots in the taupe suede colorway are almost identical with their block heel and pull-on styling, and all sizes are currently available. They also come in black. The chunky, 3.5" block heel is nice and sturdy, and I like that the boot shaft height is just right at 15.5." They're also slightly slouchy and can be scrunched down more depending on how you like to wear them. I like to push mine down about an inch or so for a cute, more relaxed fit. 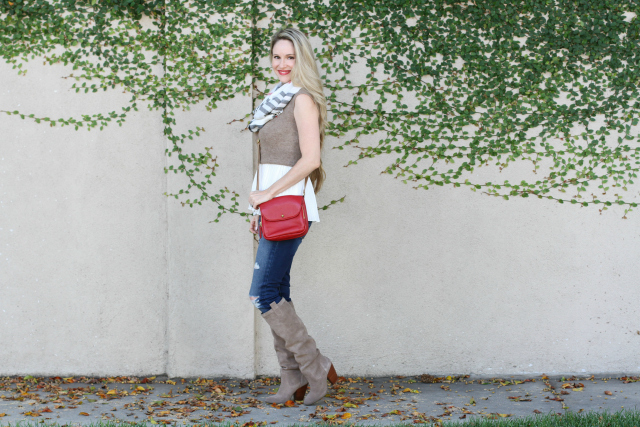 For a fun pop of color, I added this cherry-red leather crossbody. This is the J.Crew Factory Jericho Pursette from several seasons past, but this season's J.Crew Signet Bag in 'festival red' Italian leather is very similar. It's a smaller, more compact bag, which makes it easy to just throw it over your shoulder and go. I also like adding dimension to my outfits, so I layered on this silk pashmina, which is a great Burberry dupe I found on Ebay for only $12! I found an identical one here for the same price. 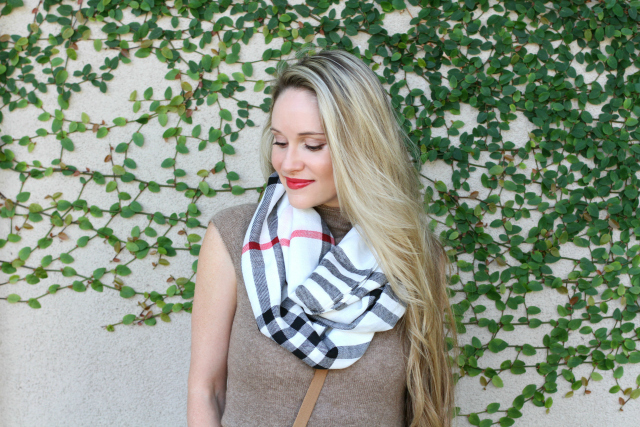 The classic plaid pattern is lovely, and the pashmina itself is lightweight and super versatile, allowing you to wear it in a variety of ways. For this look, I just wrapped the ends around and tucked them under to give the effect of an infinity scarf. Easy-peasy! A swipe of red lipstick can really do wonders! I chose this gorgeous, vibrant shade to brighten up my face and to also complement the red in my bag and scarf. I used one of my go-to red lippies, the L'Oreal Paris Color Riche in #301 "Real Red." Not only is the color pay-off amazing, but the formula is extremely soft and moisturizing. It glides onto your lips like silk! What are some of your favorite seasonal looks?